Just Jingle: Skipping Stones Design Feature Friday! This is my second post of the day! Please check out my Pretty Spring Three Birds card below! Well, it just so happens to my turn for Feature Friday over at Skipping Stones Design and I decided to feature the brand new Sassy Cats 2 set because, well, because it's freaking adorable AND hilarious, that's why! HA! Now, I'm the first to admin that I am NOT a cat person, but that does not mean that I can't have some fun with these cat stamps! The sentiments are just too cute, too! 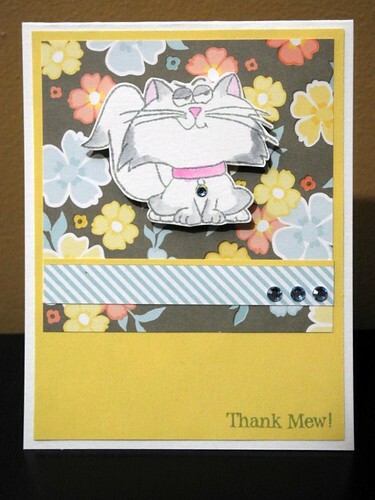 I stamped the cat and then used my Tombow markers to add just a touch of color. You can really do a lot with color to give these cats different looks! This is my second post for today, so be sure to check out my Friends With Flair Friday post, too!!! YAY!!! I love the little gem on his collar - too cute! Very cute -- love the sentiment! Great job, so cute! Love those stamps! Love the little grin on the cat's face! Too cute! what a fun card...I am so loving the cats mischievious face..cute cute.. So cool and sweet! 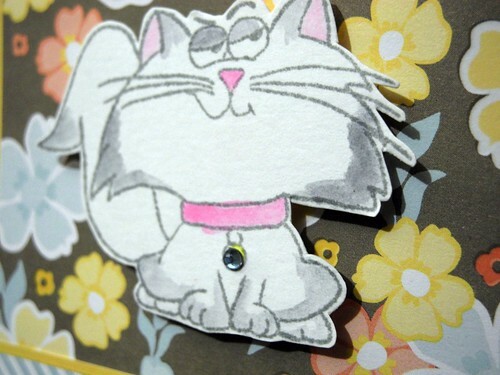 LOVE your card and that fab cat! I'm a cat lover, & THESE - especially the 'rear view' - LOL - are awesome. I like how you are still incorporating the grey and yellow into your art! NICE! very cute card, fabulous stamps! LOL, and that's a 'Thank Mew' with attitude! What a fun card! that is a seriously cute cat!! i'm not a cat person either. I'm not an animal person in fact. haha! toooo cute!!! lovin that stamp set!